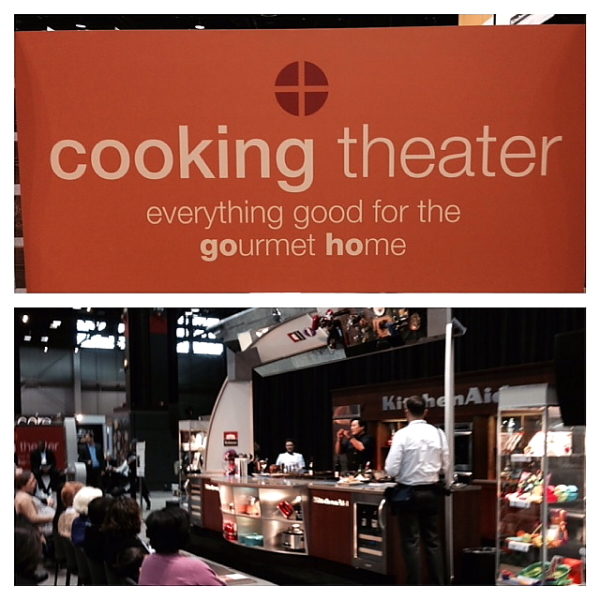 The International Home and Housewares Show is an event that my daughter Kristina and I look forward to every year. McCormick Place in Chicago becomes a culinary dream and is filled with every kind of kitchen item imaginable, a line-up of celebrity chefs cooking their dishes and selling cookbooks, and for us, every day filled with dinners at some of Chicago’s best restaurants. It used to be that Kristina and I would drive back and forth every day from my home about an hour away, but this year we decided to stay in Chicago for the entire stay – and it was worth it! 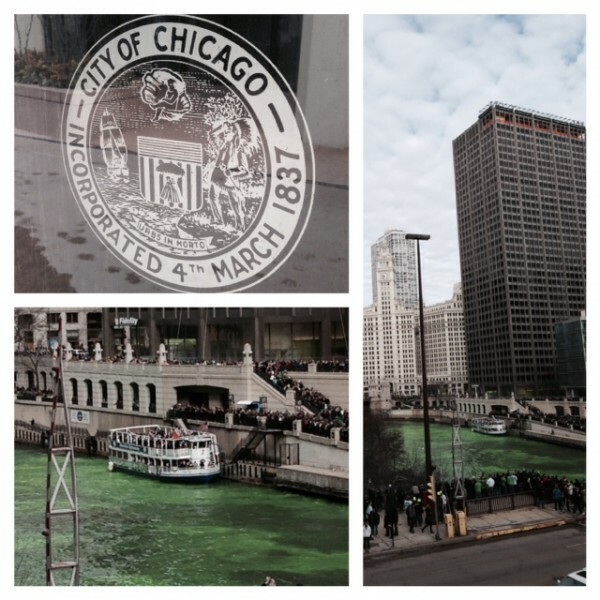 We decided on the Fairmont in Millennium Park, with its easy access to one of the most picturesque areas by the Chicago River, which since it was St. Patrick’s Day weekend, meant that we had only a short walk to the river and could watch it being dyed green for the holiday. We didn’t let the falling ice problem deter us. 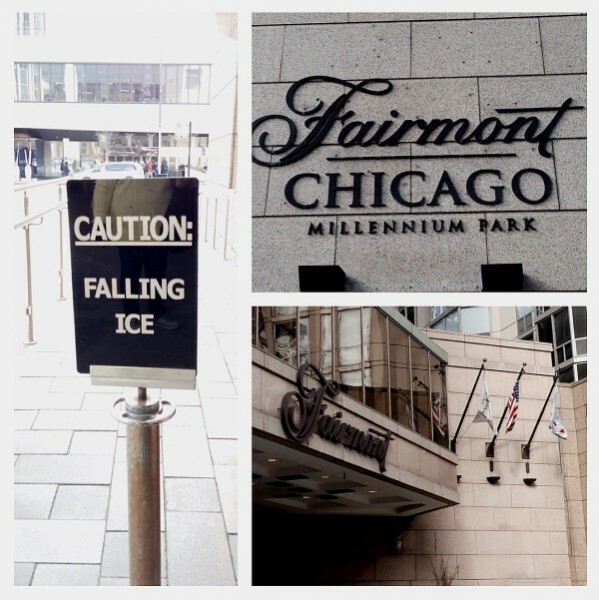 As many of you may know, Chicago had one of its worst winters ever and falling ice signs were commonplace. 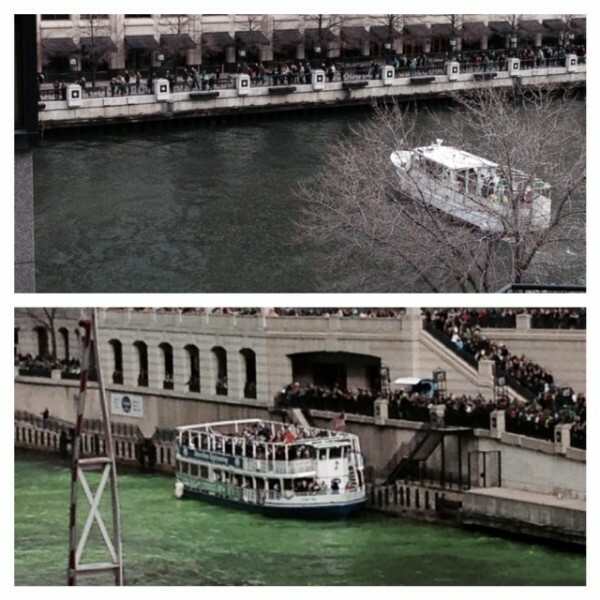 Here is the “before” and “after shot! People were lined up everywhere to watch this great Chicago tradition. I am so lucky to live near one of the greatest cities in the world! My youngest daughter, Kara, was also joining us at the Home Show for most of the weekend. She was not able to attend our dinners, so Kristina and I wanted to do something special for her while we were gone for the evening. 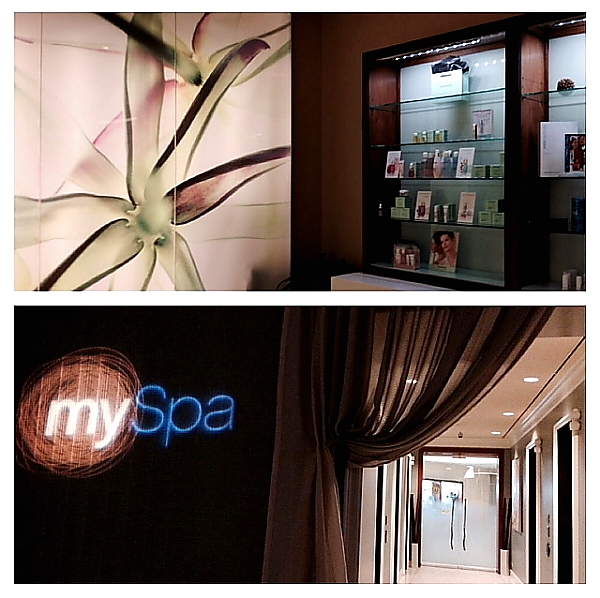 As we walked to the elevators, we noticed a sign for the hotel spa and knew that’s what we would do. Kara loves massages and we got her a gift card to enjoy herself with a deep tissue massage and added aromatherapy. She said it was one of the greatest massages she has ever experienced! As Kara was enjoying her massage, Kristina and I left to attend our first event, a party to commemorate the 200th anniversary of Wusthof knives. The party was held in the Rouge room of the Fairmont. We figured out very quickly which room it was. It literally glowed rouge! 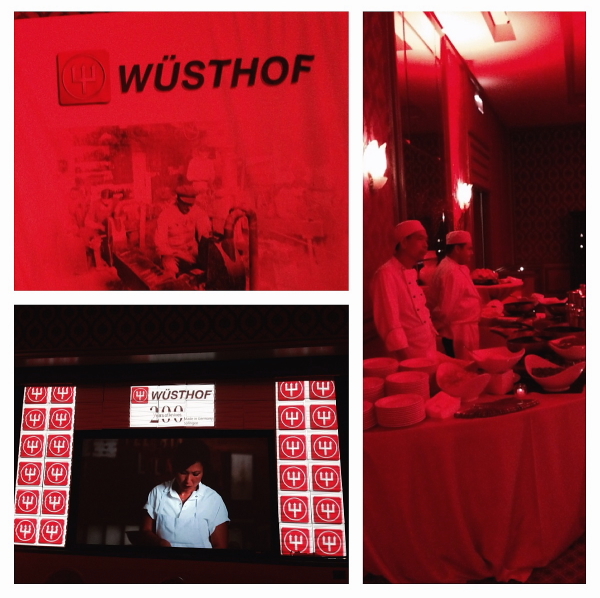 Wusthof knives are crafted in Solingen, Germany, the site of its manufacturing plant since the company’s founding in 1814. There is a highly collectible 2014 Anniversary set available nationwide as of April 1st. I have never owned any other knives except Wusthof. They are simply the best. We couldn’t stay for the entire evening as we had another engagement with our wonderful friends at Cuisinart at one of Chicago’s best Michelin-starred restaurants, Elizabeth. 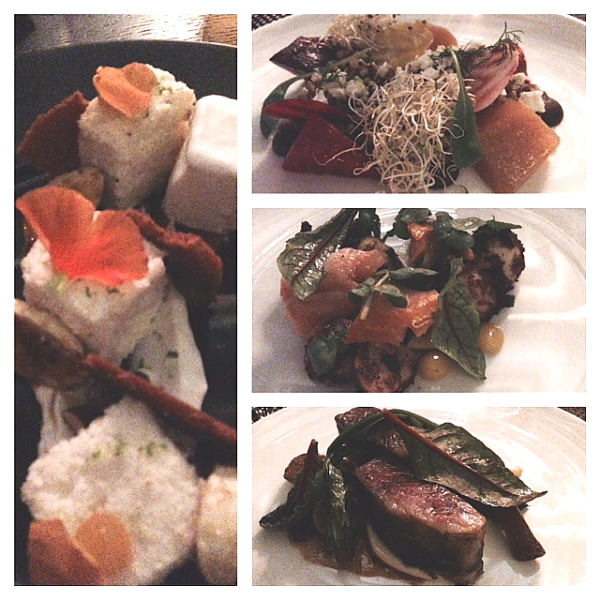 Our dinner at Elizabeth was so incredible and creative that it’s going to have to be its own blog. Watch for it soon. It will blow you away! We spent the next morning and afternoon walking aisle after aisle at the show, but that will all be in the next blog. We enjoyed seeing chefs Ming Tsai, Rick Bayless, Jose Andres, Fabio Viviani, Curtis Stone, Gale Gand, and Grant Achatz, who I missed! I really wanted to watch him cook and have him sign a cookbook, but there aren’t enough minutes in a day at the show. The Cooking Theater was active all weekend. Below is Ming Tsai. As you can surmise, there is so much to do at the show and all the events, I could probably write a separate blog on each one! If you are a culinary professional, you must come to experience all of this yourself. You will want to return every year. It’s in March again next year, so go to the website and see if you qualify to attend the show. 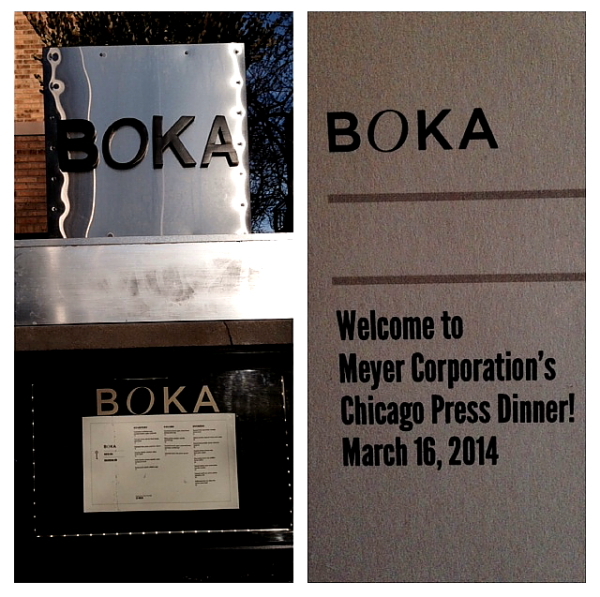 Our dinner the next evening was at Boka, another Michelin-starred restaurant, with our friends from the Meyer Corporation. Boka is located in a very popular neighborhood along with Alinea and the Steppenwolf Theatre. Kristina performed in a play once at Steppenwolf and couldn’t believe how the area has changed since she was in college. Let’s just say it wasn’t always the safest place in the past. 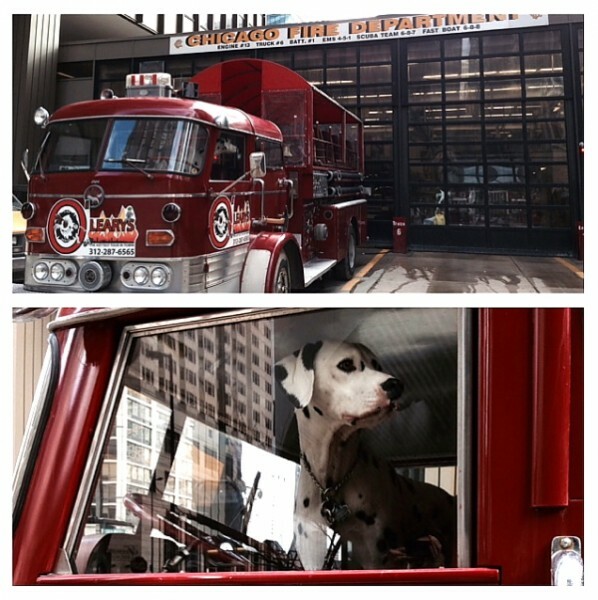 As we entered Boka, we knew we were in for a treat. As someone showed us to the area of our party, we passed an unusual painting. That looks like Bill Murray, I said to Kristina. 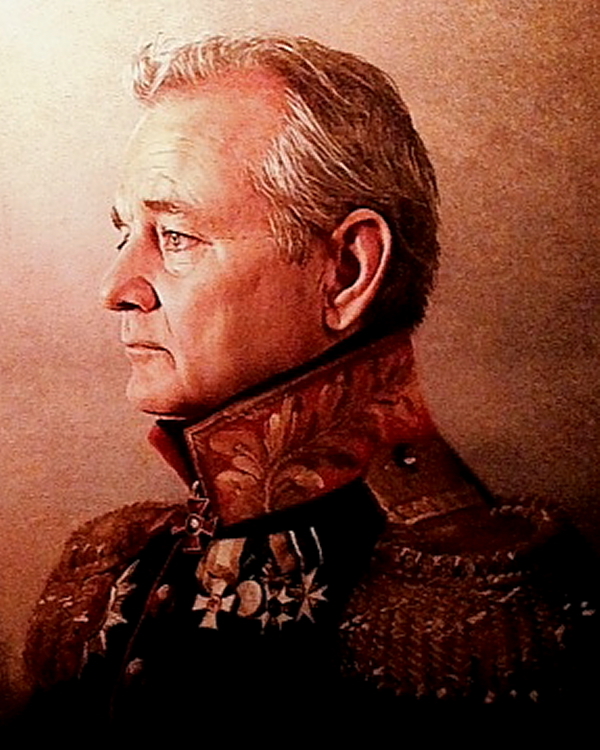 Oh, wait.. it is Bill Murray. We never did figure out if the owner was a fan, or maybe the actor liked the restaurant. We chatted with the other guests before dinner and had a great time. As we sat down for dinner in the cozy environment, we couldn’t wait to read the menu for the evening. For the first course, I selected the marinated beets; second course the potatoes with arctic char; third course the grilled short ribs, and dessert the angel food cake and coconut sorbet, both in tiny cubes. Everything was fabulous. The next morning we were happy to discover that our breakfast would once again be with the Meyer Corporation. They offered us pastries and yogurt before beginning our tour of their clients, including Anolon, Circulon, Farberware, Bonjour, Rachael Ray, Paula Deen, Cake Boss, Earth Pan, and Silverstone. 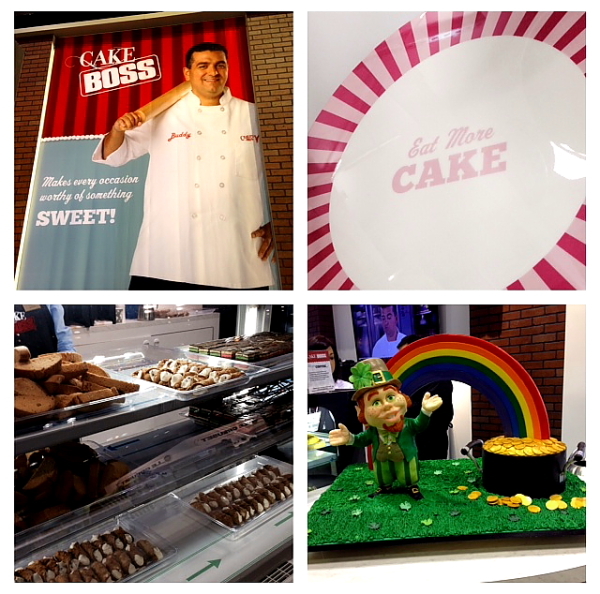 First stop was with the Cake Boss himself, Buddy Valastro. Buddy’s area on the show floor is huge! In the front is a large display of pastries which were offered to everyone. Next to the case was a cake made just for St. Patrick’s Day. On display was every kind of baking product needed to make Buddy’s recipes. After enjoying all the products, Kristina and I made our way over to another area of the show called Lakeside, where I would attend a seminar on how baby boomers fit into the world of millenials (very well, thank you!) while Kristina had meetings scheduled. 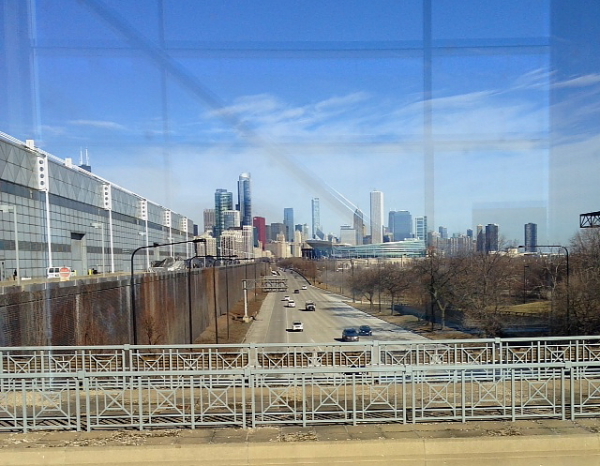 To reach Lakeside, one must cross a huge overpass that gives a delightful view of the city. 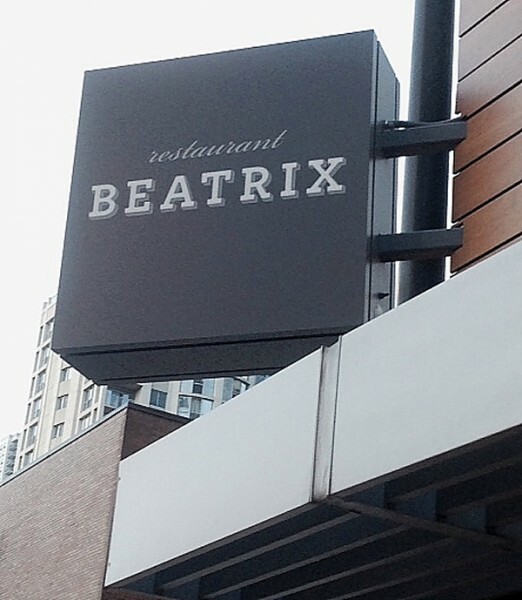 Our last dinner of the weekend was held at restaurant Beatrix with the friendly, inspiring people of Epicurean. Wait until you read about Epicurean products in the next blog. Fascinating. The food and company were marvelous, and we hated to see it all come to an end. (Thank you Dan and Rachel- you are amazing!) All I can say is, we have already marked our calendars for next years’ show, March 7-10, 2015. Are you going to join us? Come back in a couple days to read about all the new and favorite products we found! It looks like you had an absolutely amazing time! Good for you and Kristina! Sounds like you and Kristina had a great time. I’m just a wee bit envious because I have a huge chef-crush on Ming Tsai. 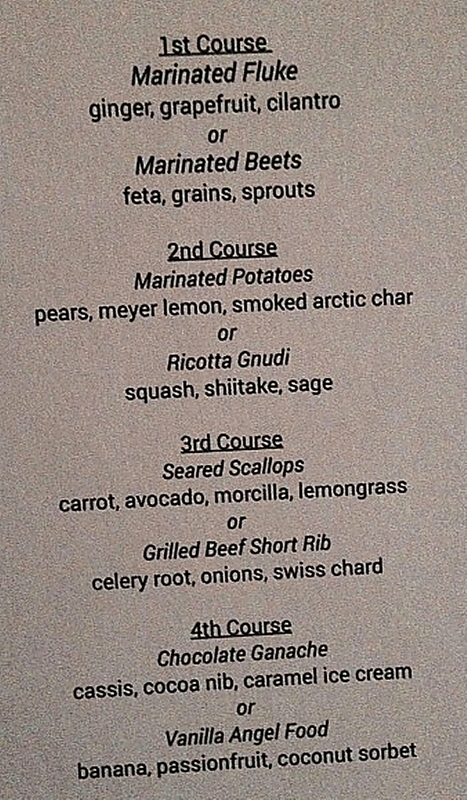 The meal at Boka looks delicious. I probably would have made the same choices you made, except I can never pass up the opportunity to eat scallops. I love them! I also share your love of Wusthof knives.